This document is an overview of the Edit Categories feature in RacePoint BlueprintTM. 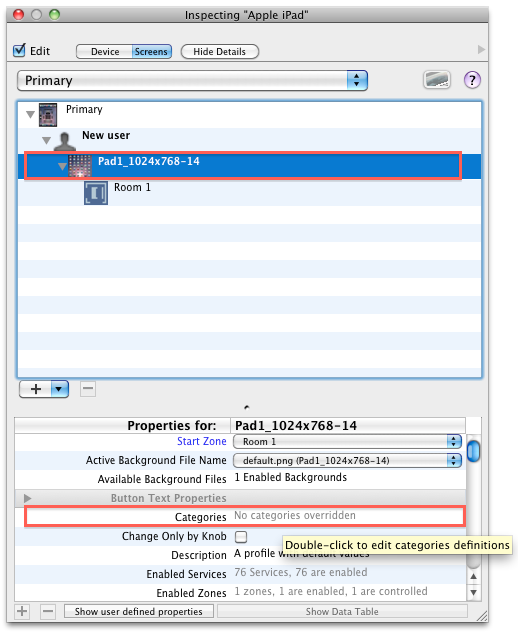 The Categories property in the Inspector window, allows the ability to edit the categories for iOS devices. Note: When the Edit Categories dialog is first opened, it will display the entire Categories hierarchy that is in the Theme selected. If you make any modifications, those modifications (and any parts of the structure affected by your modification (parents of modified items) will be shown in Magenta and the tool tip will note that it is overridden. Edit the names of most items by clicking on the item after it has been selected (just like in the Finder). (+) Button: Adds a new item as a child of the selected item. The item added via the (+) button will depend on what the selected item can have under it. It will add the appropriate item(s). (-) Button: Removes the selected item and anything under it in the hierarchy. Note: The (+) and (-) buttons will only be enabled if it is possible to add a child to the selected item or to remove the selected item, respectively. 1. Disclosure triangle: This triangle is located at the top-right corner of the dialog. It opens and closes a drawer with two different tabs; the Services tab and the Buttons tab. 2. Buttons tab: Add new button identifiers to the Query list by dragging buttons from the drawer. A list of all Service Buttons in the configuration will be displayed. Drag one of these buttons to the Query list to add that button's identifier to the list. Use the checkbox as normal for whether you want it excluded from the results or not. 3. Categories: The top level under which all Categories are listed, this is always labeled Categories in this dialog box. 4. Icon: This level corresponds to a category button that will be represented on the iOS UI. The standard buttons are All Icon, Video Icon, Audio Icon, Climate Icon, Energy Icon, Settings Icon. 5. Query: This level corresponds to a Query and Target Container (the dock that is going to contain the results of the Query) and, optionally, the Category Type. The Query contains a list of query terms that determines what will be displayed in the target container. The terms of the query can be any of the following, which matched any service or button, a service type dragged in from the Services drawer, or a specific service button identifier dragged in from the Buttons drawer. For terms in the query, you can specify whether the query in inclusive (matching values included in the result), or excluded (matching values excluded from the result) by checking or un-checking the excluded checkbox for that query term. Note: The Query items can not be edited. The Query terms can only be modified by deleting entries using the (-) Button or dragging entries from the Services or Buttons tables. 6. Target Container: Refers to the Bottom Dock (the bottom dock on an iOS UI) by default. 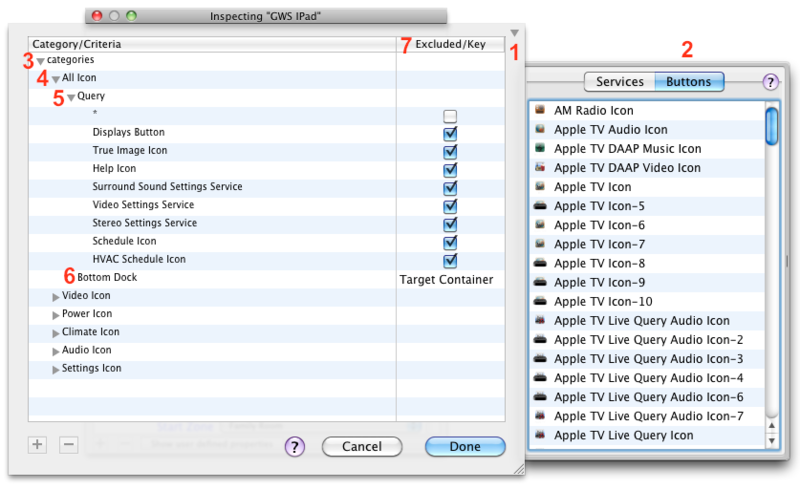 It can contain any of the following values; Bottom Dock, Top Dock, Content. 7. Excluded/Key: This column indicates whether an icon is included or excluded in the UI. The Key will refer to the location of the icon. 8. Services tab: See the image above for an example. Add new Service identifiers to the Query list by dragging Services from the drawer. 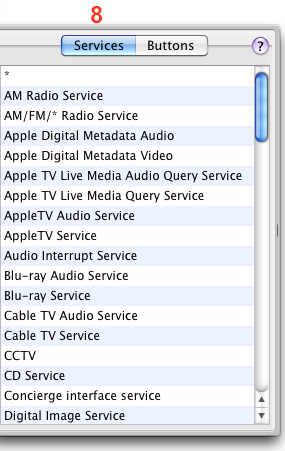 A list of all possible Services will be displayed. Drag one of these Services to the Query list to add that Service identifier to the list. Use the checkbox as normal for whether you want it excluded from the results or not. To add a wildcard (*) Query entry drag it in from the Services tab.